Large and growing numbers of U.S. children and young people are suffering from depression, anxiety, attention deficit, conduct disorders, thoughts of suicide, and other serious mental and behavioral problems. Why? What can be done to reverse this trend? 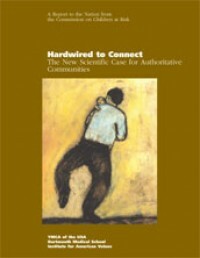 This pioneering report draws upon a large body of recent research showing that children are biologically primed (“hardwired”) for enduring connections to others and for moral and spiritual meaning. The authors introduce a new public policy and social science term—“authoritative communities”—to describe the ten essential traits across social institutions that produce better outcomes for children. The Commission on Children at Risk is a group of thirty-three children’s doctors, research scientists, and mental health and youth service professionals. It is an independent, jointly-sponsored initiative of the YMCA of the USA, Dartmouth Medical School, and the Institute for American Values. The Commission’s principal investigator is Kathleen A. Kovner Kline of Dartmouth Medical School.